Helicopter OH-6A 69-16011 was manufactured in 1969 and was number 470 off the production line of the Hughes Tool Company. The aircraft was shipped direct to Vietnam where it served in the 20th Transport Company. The aircraft technical records show that at 250 hours from new on the 17th August 1970 whilst serving in this Unit, the helicopter was on a recon mission and came under fire at a flight level of 100 feet and 80 knots in South Vietnam and took 11 hits from small arms and automatic weapons. The majority of these hits were on the underside of the aircraft causing damage to the fuel system and some aircraft components. Luckily the armour plating proved effective protecting the flight crew and out of the three crew on board, only one was wounded in action. The aircraft served with the 13 other aircraft from Alliance Airport at Fort Worth and was disposed of by auction on 4th May 2004. It was then purchased by a helicopter dealer and put into storage for a number of years. 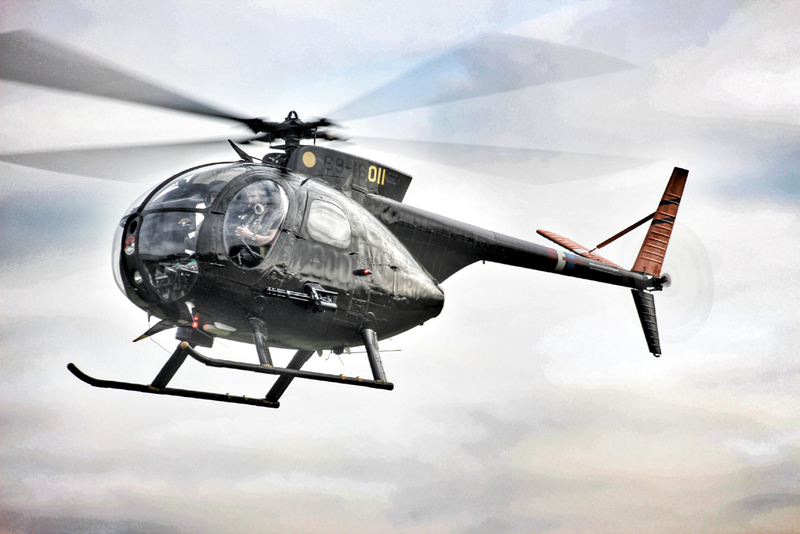 It was at this point where Phil Connolly found the unit in storage in Seattle and having conducted the research with the aircraft records regarding the battle damage in 1970 he decided it would be the ideal fit into his helicopter activities and business in the UK.